Meet your company’s high security standards with the provisioning feature. Provisioning allows you to implement an approval workflow for platform access and permission requests from either individual users or groups. After getting a notification, you will have the option to approve or reject new permission requests at one single place. Controlling access to brand resources and projects will therefore easily meet your company’s security requirements. Once this feature is enabled, users who invite others to the platform have to mention the reason why they want to invite someone. Stating a contact person helps to get in touch for clarifications. The account owner, or someone from your compliance team receives a notification. The invitation request then shows up in the Frontify Usage Overview, which can be entered by clicking on your profile picture (bottom left) > "Usage Overview". All the relevant information regarding a request is summarized in the usage overview and can be accepted or rejected straight away. In the case of a rejection, a reason can be stated. 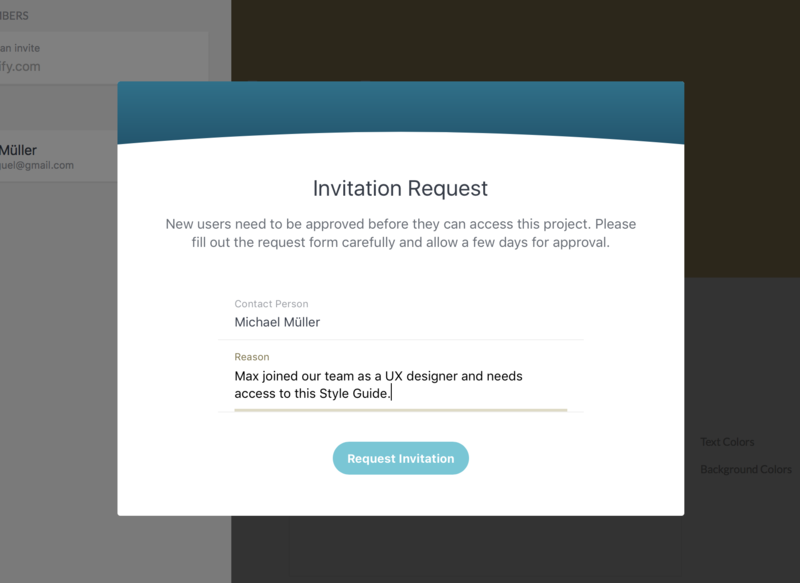 In the case of an approval, an invitation email is sent out to the prospective user. Note that the approval workflow described above depicts the permission request processing of individual users. The approval process for groups is basically the same. You can trigger either user or group provisioning by clicking the team icon, as shown below.